Dr. David Kwiatkowski is Professor of Medicine at Harvard Medical School, and Senior Physician at the Brigham and Women's Hospital and Dana Farber Cancer Institute. 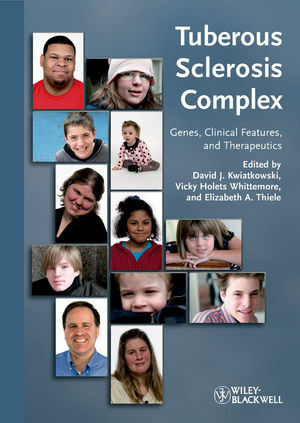 He is the recipient of the Gomez Award for research contributions in tuberous sclerosis (TSC), and has authored over 180 original publications, of which nearly half are on various aspects of TSC. His current research interests include understanding the pathogenesis and genetics of TSC, development of mouse models of the disease, and exploration of potential therapies in preclinical models. Dr. Vicky Holets Whittemore is the Vice President & Director of Science for the Tuberous Sclerosis Alliance, the only voluntary health organization for TSC in the US. She received her PhD from the University of Minnesota; post-doctoral training at the Karolinska Institute in neurobiology, and left academics when she was Associate Professor of Neurological Surgery at the University of Miami, Fla to run the National Tuberous Sclerosis Association in 1994. She is the mother of a child with TSC, and is highly knowledgeable about the disease, and a tireless advocate for TSC patients and families. Dr. Elizabeth A. Thiele is a neurologist and epileptologist at Massachusetts General Hospital. She received her medical education at Johns Hopkins University School of Medicine, and post-graduate training at the Johns Hopkins Hospital and Children's Hospital in Boston. She established and directs the Herscot Center for Tuberous Sclerosis Complex, and is Director of the Pediatric Epilepsy Service at Massachusetts General Hospital. She is an Associate Professor in Neurology at Harvard Medical School. Dr. Thiele's research and clinical interests focus on multiple aspects of the clinical management of tuberous sclerosis, including epilepsy management, genotype-phenotype correlation in TSC, and neuropsychological aspects of TSC.